Welcome to the Culver Village! 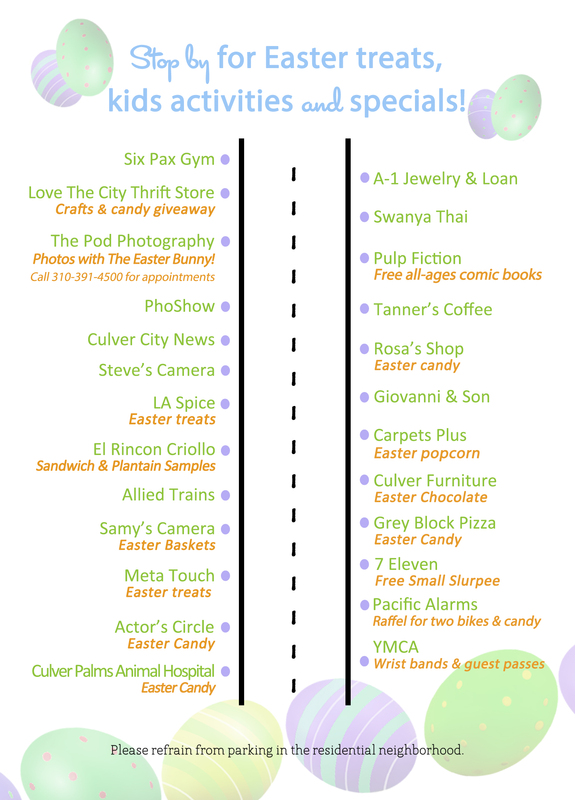 The Culver Village Bunny Hop – April 4, 2015 from 1-4pm. The Culver Village invites you to bring your Easter basket and join the bunny hop! 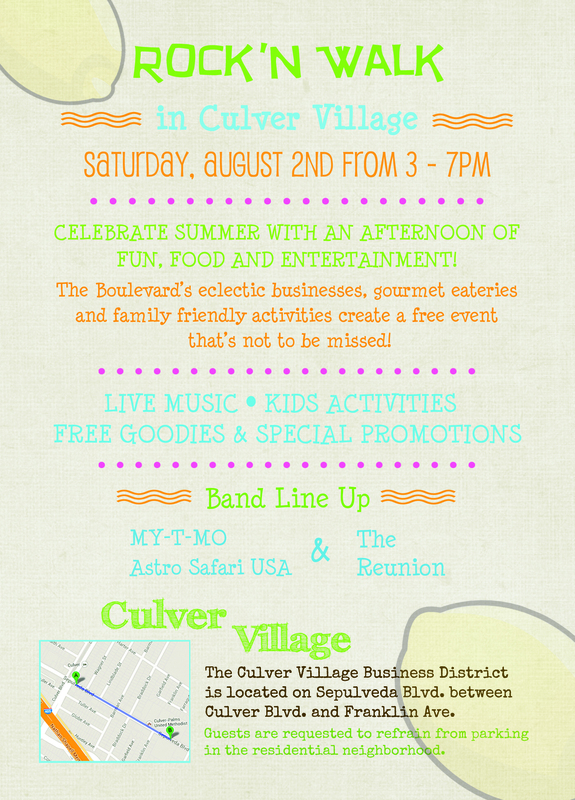 On Saturday, April 4th from 1-4pm, the business of Culver Village will be handing out treats, offering promotions and hosting fun activities. This is a free event for all ages. Be sure to bring your Easter basket to collect all the goodies! The Culver Village Holiday Bash! Celebrate the season with delicious treats, free kids activities and holiday specials at the annual Holiday event in the Culver Village! The Village’s eclectic businesses, gourmet eateries and family-friendly shops will be spreading holiday cheer with tasty small bites and promotions such as photos with Santa at The Pod Photography (call 310-391-4500 for appointments), caramel & apple pops at LA Spice, free “Make your own movie trailer” at Actor’s Circle, free pet photos with Santa at Culver Palms Animal Hospital, a Winter Wonderland with treats and kids activities at the Gilded Bee Boutique, holiday crafts at Love the City Thrift Store, free passes at the YMCA, several raffles and much much more! 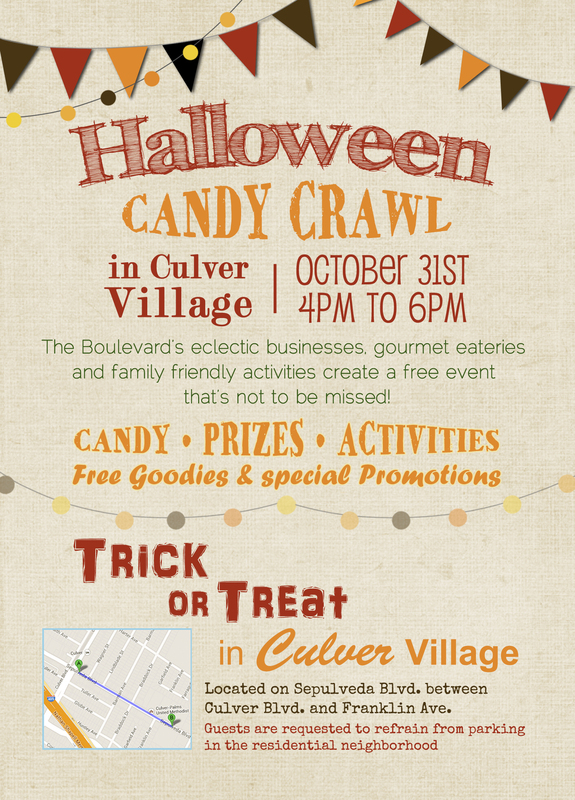 Join us for the annual Halloween Candy Crawl in Culver Village from 4-6pm on October 31st. The businesses, shops and restaurants will be handing out candy as well as offering fun promotions and giveaways for kids and parents alike! The Culver Village is the perfect, family friendly place to begin your early Halloween festivities! Located on Sepulveda Blvd. between Culver Blvd. and the YMCA. Celebrate Summer with an afternoon of fun, food and entertainment! The Boulevard’s eclectic businesses, gourmet eateries and family friendly activities create a free event that’s not to be missed! 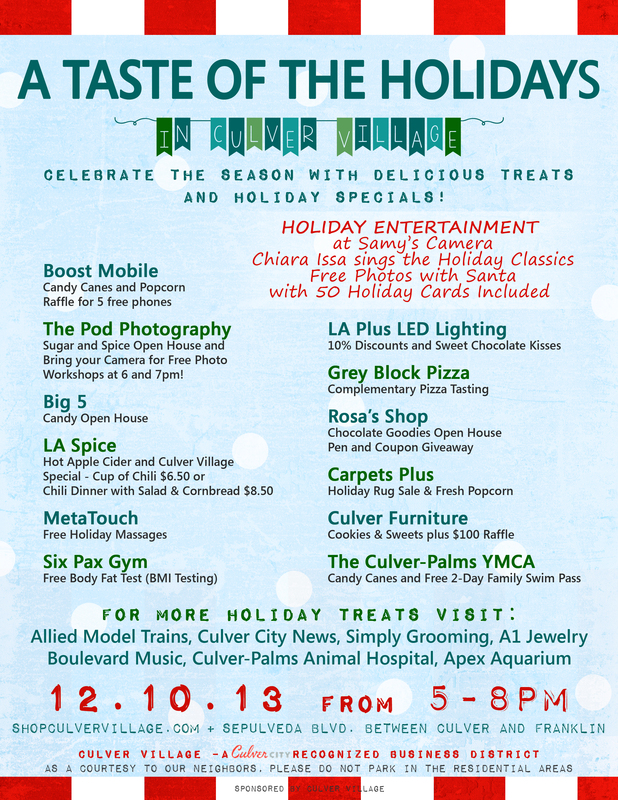 Celebrate the season with delicious treats and holiday specials for the annual Holiday event in the Culver Village from 5-8pm on December 10, 2013. There will be holiday entertainment as well as free Santa photos (with 50 holiday cards included) at the Samy’s Camera lot. The Village businesses will be spreading holiday cheer with tasty small bites and promotions such as a special dinner for $8.50 at LA Spice, Free Camera workshops at 6 and 7pm at The Pod Photography, complementary massages at MetaTouch, a free weekend swim-pass at the YMCA, several raffles and much much more! Trick or Treat in Culver Village! 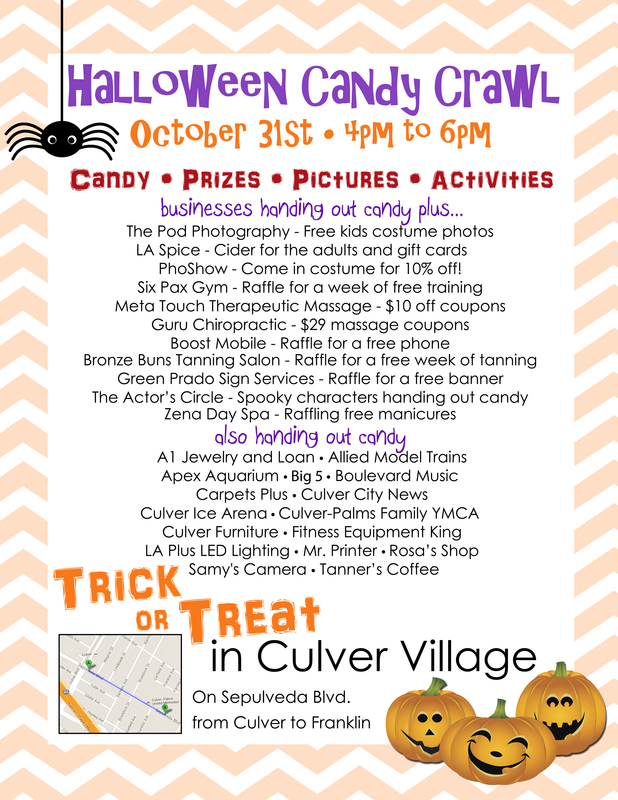 Join us for the annual Halloween Candy Crawl in Culver Village from 4-6pm on October 31st. More than 30 local businesses, shops and restaurants will be handing out candy as well as offering fun promotions and giveaways for kids and parents alike! The Pod Photography will be taking free photos of kids in costume at their studio during the event – walk-ins are welcome or call 310-391-4500 to make an appointment. The Culver Village is the perfect, family friendly place to begin your early Halloween festivities! Located on Sepulveda Blvd. between Culver Blvd. and the Ice Rink.